In his book Was America Founded as a Christian Nation? 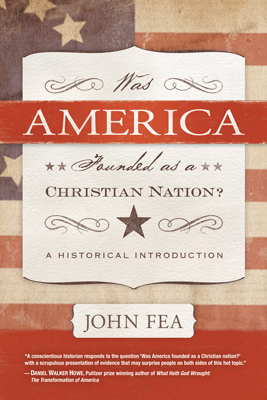 John Fea explores the history of Christian nationalism, the relationship between Christianity and the American Revolution, and the beliefs of several of America’s founders. The most interesting and original part of the book shows that there have always been significant figures in American history, often on opposing sides of the political spectrum, who have said that America was founded as a Christian nation. Fea also provides a conventional account of the American Revolution which highlights the defence of that political action within arguments that he says did not depend on “traditional Christianity”. And he summarizes the beliefs of several prominent American founders like Thomas Jefferson, Samuel Adams and John Witherspoon, who held a range of differing views on the relationship between church and state. As the primer Fea intends Was America Founded as a Christian Nation? is clearly written, concisely argued, and broadly sympathetic to its subject. Fea has a good handle on his question, and he pursues the laudable aim of bringing “historical thinking” to a wider public. An important part of what constitutes such historical thinking, for Fea, is an admission of the “complexity” of the past and the historian’s duty to capture a sense of that past’s “fullness”, by showing that Christian nationalism has been a part of American history since its inception, for example, or by detailing the chequered history of Jefferson’s “wall of separation” metaphor. To say that the question of Christian nationalism has a complex history, however, is not necessarily to say why that history is complex. Would a description of the important, indeed complex, place of magic in early modern European and Anglo-American life necessarily tell us anything about why it declined? Likewise, does a historical description of American Christian nationalism tell us why or how it has persisted? Given the presence of Christian nationalists like David Barton on the contemporary political landscape, will a judiciously descriptive account of the history of American Christian nationalism have an influence on those inclined to view the past providentially through cross-tinted lenses? Was America Founded as a Christian Nation? does not trace any alternative historical narrative of American nationalism, religious or otherwise. There is thus no historical sense of how Christian nationalism relates internally to other conceptions of American nationalism, whether or not that nationalism was itself subject to change, or how the language of Christianity and Christian nationalism harmonized with the political vocabularies of American history. Did it mean the same thing to say America was a Christian nation in 1776 as it does in 2011? Furthermore, there is no sense of how Christian nationalism in America fits in a wider historical perspective. Surely it is a centrally important question to ask how religious nationalism in America compares with the history of nationalisms of other sovereign states. Christianity is obviously an international religion, and it would be helpful to know why, for instance, Christian nationalism has thrived in America but has become anathema in Canada and Western Europe. Finally, there is an implicitly Christian undertone to questioning whether or not Christian nationalists of the past, colonists, Revolutionaries and founders, acted as “traditional Christians” should. This question will be of interest to those in a Bible study, perhaps, making the rather belaboured point that Christians haven’t always acted up to their professed beliefs; but it is unclear how such a “lesson” enriches or even complicates our historical understanding of America’s past. If the historian’s job includes a responsibility to capture the “fullness” of the past by tracing change over time in context through a causal explanation rooted in complex contingency, as Fea lays it out, then it seems like a shortcoming, especially in a primer, to isolate the question of American Christian nationalism from an internally deeper and externally wider set of changes, causes and contexts. Without venturing beyond the somewhat parochial confines of the question’s immediate scope, or offering a historical explanation of why these answers have been so persistent, the invitation to think historically might very well go unnoticed. Was America Founded as a Christian Nation? by John Fea. Westminster John Knox, 2011, 304pp.